St. Michael (the Red Wing) had the most liked content! Legwand helped us get into the playoffs. He was invisible though in the playoffs. So I don't know maybe yes??? The Bruins shut him down. The Bruins shut down all the kids tbh. quite the disappointment heading into the olympic break. but it is what it is. lot's of work to do when we start up again. we control our own destiny. Really like our current line combos. For once. Goose is so hot right now water cannot cool him. Kid has it. Steven Stamkos will not play for Team Canada at the Sochi Olympics. bummer about Stamkos but well deserved replacement. don't know what to expect. missing this game due to work but following aka twitter style. LET'S GO WINGS!!! So what do we call the 26 - 15 - 21 line? 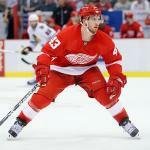 Wings to inquire about Vanek? i don't know what to expect anymore. regardless LET'S GO WINGS!!! Better rephrase that. Yes I'm finding the reffs are ruining the game or deciding games anyway. Some games you just gotta put the whistle away and let them play.